The CON­TEGA SOLIDO SL-D joint ad­hes­ive tape, which is full-sur­face ad­hes­ive and can be plastered over, en­sures in­teri­or air­tight and va­pour-re­tard­ing seal­ing of win­dows and doors to ad­ja­cent build­ing com­pon­ents made of wood and min­er­al sub­sur­faces such as con­crete and ma­sonry. The in­teg­rated ad­hes­ive zone on the fleece side makes it easy to seal joints to win­dows and doors. These bonds will cor­res­pond to the re­quire­ments of DIN 4108-7, SIA 180 and OENORM B 8110-2. Before sticking, subsurfaces should be brushed off or wiped clean with a cloth. Uneven mineral subsurfaces may need to be levelled with a smooth finish. Per­man­ent ad­he­sion is achieved on all pro clima in­teri­or mem­branes and on oth­er va­pour re­tarder and air­tight mem­branes (e.g. those made of PE, PA, PP and alu­mini­um). 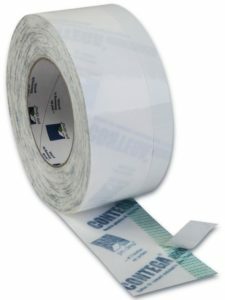 Airtight seals can only be achieved if the sealing tape is installed free of folds and breaks.